Maximizing operational efficiencies, reducing IT costs, and improving service quality and compliance are just a few of the primary concerns for IT organizations looking to improve their efficiency and deliver more strategic value to their companies. This challenge is made more complex when IT Service and Client Management processes are managed manually, or across a number of disparate systems or applications, which can be costly and time intensive in an increasingly complex IT environment. The value of an automated and unified IT Service and Client Management solution is immediate and demonstrable. A sample organization with 10,000 employees, 3,000 service requests a month, 40 hours a week spent managing changes, and 25 application/upgrade deployments per year, can experience $1.5M in savings from maximizing operational efficiencies and reduced IT costs alone. Through improved service quality and compliance, annual benefits can be as much as $2.3M. 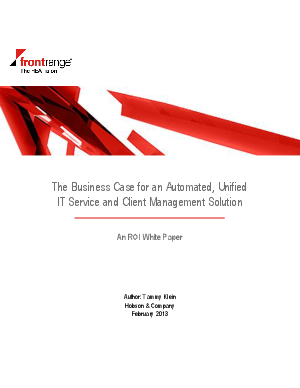 Download this paper to discover the research findings and the overall Return on Investment (ROI) implication for organizations considering an automated, integrated IT Service and Client Management solution.